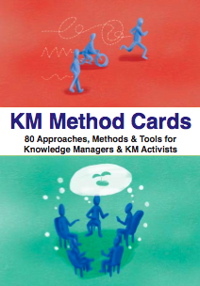 A pack of our KM Method Cards contains concise descriptions of 80 Approaches, Methods and Tools that Knowledge Managers and KM Activists can use in a variety of scenarios. ...and probably many more! Let us know how you end up using them! Want to find out what’s inside a pack? Check out the Guide to Contents, which now gives references and sources for all the techniques and approaches covered.